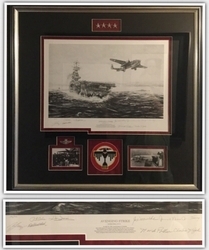 ROBERT BAILEY IS NO LONGER OFFERING AVIATION ART PRINTS - Please check with us at 1-800 233 0345 - to see if the images below are still available. Awards and Honors Robert considers it a great honor to have many of his WWII prints hanging in numerous museums, legions and Armed Forces buildings worldwide, including the US Pentagon. Education Robert attended the Longton College of Art in Staffordshire, England. Shows and Exhibitions Robert’s painting titled Forgive Them was on loan to the National Museum of Catholic History and Art in New York, NY for the occasion of the Pope’s visit in April, 2008. The NMCHA is affiliated with the Smithsonian Institute in Washington DC. Publications Bailey Art and Publishing published Robert’s first book in 2006 titled A Brush With History. 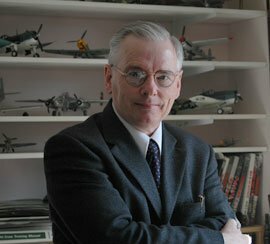 Also, images of his work has been used in a number of hardcover books such as Flying Aces, Bomber Missions and Carrier War. Permission has been granted re-use of these images in the Barnes & Noble publication titled The Aviation Art of WWII. Robert’s combat artwork is frequently reproduced in various magazines geared toward the WWII enthusiast. Special Achievements At the invitation of our Canadian Military in Cold Lake, Alberta, Robert actually flew an F-18 bomber in April 2008! His many hours practicing on his state-of-the-art flight simulator at home had prepared him quite well for this exciting adventure.